African conflicts should not be viewed in the same lens as Iraq and Afghanistan. A perfectly sensible statement, yet one that is ignored in a flood of attention paid towards the need for counter-insurgency (COIN) planning and development within African militaries. This is a poor approach to understanding the African military landscape and crises, present and future. Commanders mounting any sort of military operation, regardless of location, ought to understand the enemy they are facing and the purpose of confronting them with force in the first place. Placed in this light, there are many contemporary African conflicts that do not easily fit a straightforward COIN context. In practical terms, the recent campaign against M23 in the Democratic Republic of Congo highlighted just how unlike an insurgency warfare in Africa can be. FARDC and FIB forces faced up against a former military group that held entrenched positions and fought with relatively sophisticated tactics, including the use of heavy weapons to support attacks and even a tank or two. This is a far cry from the mobile and elusive shadow militias of the Viet Cong or Taliban fighters that characterise insurgent behaviour. M23 was defeated not with a hearts and minds campaign of civilian rapport-building and the gradual alienation of hostile forces, but through the use of direct military force against M23’s positions and gradually seizing territory that the degraded rebel organisation could not hold. This is what has recently been termed by strategists as “sub-conventional warfare”: that layer of conflict and warfighting that is not necessarily of the same tempo as state-vs-state warfare, yet is not the chasing of fleeting ghosts in the bush. M23 was not a classic insurgency as much as it was as a rogue military force to which disarmament solutions could not be easily applied. The battles against M23 epitomised this, highlighting the need for commanders to evaluate and address their enemy in the context and definitions that best suit them. M23 was not a classic insurgency as much as it was as a rogue military force to which disarmament solutions could not be easily applied. That, in turn, meant artillery, attack helicopters, tanks and reconnaissance aircraft. Tools which are frequently neither necessary nor desired in a COIN environment. Initial battles against al Shabaab by Kenya were another example of this form of sub-conventional warfare, as were the opening weeks of the fighting against Tuareg and Al-Qaeda in the Islamic Maghreb (AQIM) militants in Mali. Although both would shift to resemble insurgent forces later, that was less a deliberate choice and more the result of the strategic circumstances in which these organisations found themselves once evicted from their strongholds. This is not to say that developing COIN military capacity is unimportant: It remains a constant issue in the field of African security. Yet often destroying kleptocratic bandits and rebel organisations requires less application of FM-324 (The USA’s COIN manual and general go-to dictionary for fighting insurgency) and more kinetic solutions. What is the difference in practical terms? First, the planning requirements of African military forces should reflect this diffuse array of challenges, as should their relationship with the EU and USA as these actors shift their COIN feet to Africa following the winding down of the Afghanistan and Iraq campaigns. In the first case, it is tempting for defence policymakers to hyperbolise the threats that their military could face in order to justify retaining large conventional forces. South Africa is particularly guilty of this. Its 2012 Defence Review – now stuck in bureaucratic quagmire – stresses a large multi-division defence force incorporating sophisticated armour, aircraft and naval forces meshed into an elegant marriage of Joint Operations Warfare. But the review failed to provide a “what if” scenario for the very real possibility that the billions of dollars required for this was neither available for defence nor forthcoming any time soon. The branding of ADF-NALU as a terrorist organisation with strong parterships to Al Shabaab and – most critically – al Qaeda, was a particularly obvious invocation of the terrorist bogeyman. Stressing the need for flexible forces able to respond to the plethora of conflicts and crises in which South African forces have and will continue to find themselves may not match a Defence Review that says everything is important. Equally so the defence policy that stresses everything is insurgency and irregular warfare will miss critical realities about modern African conflict. The battle of Bangui and the recent campaigns against M23 have shown a need – in terms of SANDF responsibilities to the UN and its predicted future deployments – for airlift, tactical and strategic intelligence, better infantry systems and possibly one or two additional procurement chains. These will be required to give South African infantrymen more teeth when next they face opponents who also wear camouflage and use artillery. So simply stating that African crises are many and multi-faced should not be confused with a need for large-scale arms procurements. COIN represents an aspect of African conflicts that is often less-important, and which should not in itself justify billions in defence planning and procurement. Therein lies the second point. AFRICOM troop levels in Africa will soon reach brigade-level (5000+), providing a wealth of training and cooperation programmes throughout Africa. 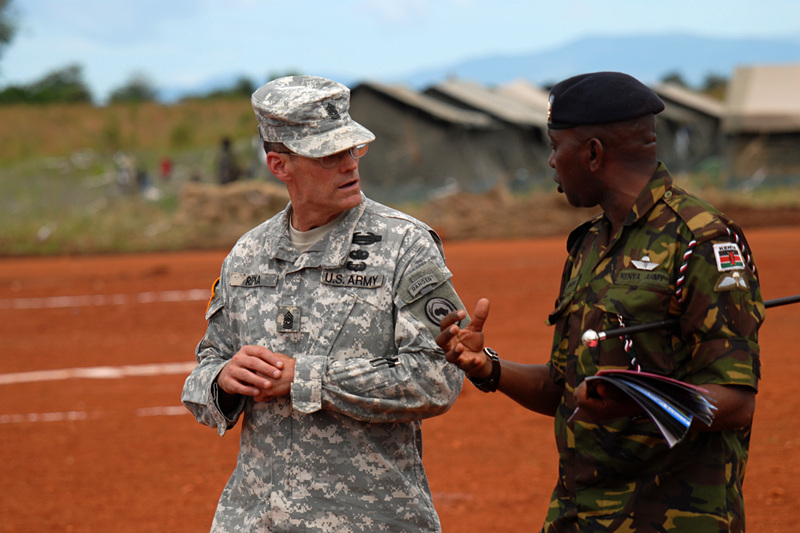 Thirty eight African countries currently host American troops inside their borders. The emphasis thus far? Counter-terrorism. Al Shabaab and AQIM are certainly important organisations, whose eradication would be welcome, but dominating African military capability training and defence partnerships through the framework of counter-terrorism can create a self-perpetuating scramble for re-identification. A case in point would be the rush by states to label internal rebel groups as ‘terrorist’ organisations, thereby soliciting western defence attention and, most critically, funding. The branding of ADF-NALU as a terrorist organisation with strong parterships to Al Shabaab and – most critically – al Qaeda, was a particularly obvious invocation of the terrorist bogeyman. Although additional attention to ADF-NALU is generally good, misunderstanding the purpose of the group and dismissing them as terrorists reverts back to the original problem of misunderstanding one’s enemy. Simply assuming a group to be terrorists or insurgents can result in a host of poor military solutions and procurement policies, which ultimately translates into more bodies coming home than absolutely necessary.